Barry Howard, Manager of The Asheldham Centre, has produced the following. 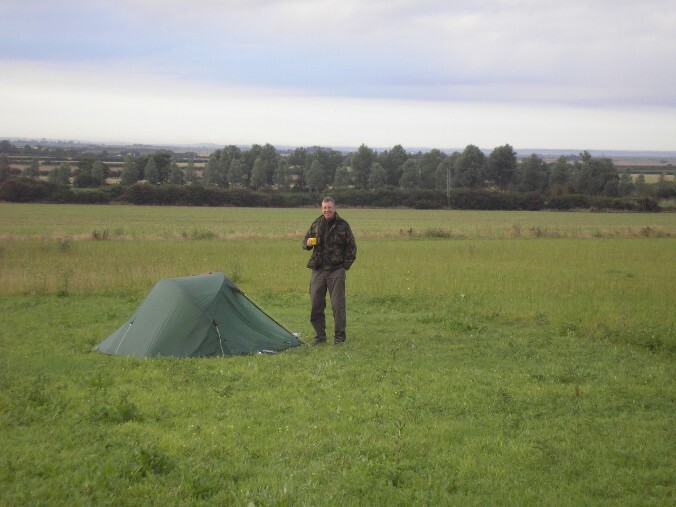 As part of the Directing Staff at 'HUNTER Outdoor Training' he leads day, night, and multi-day winter backpacking expeditions across our area (and all over the UK) and thus knows the vagaries, and unique terrain and weather patterns experienced here which can mislead unaccompanied group leaders. 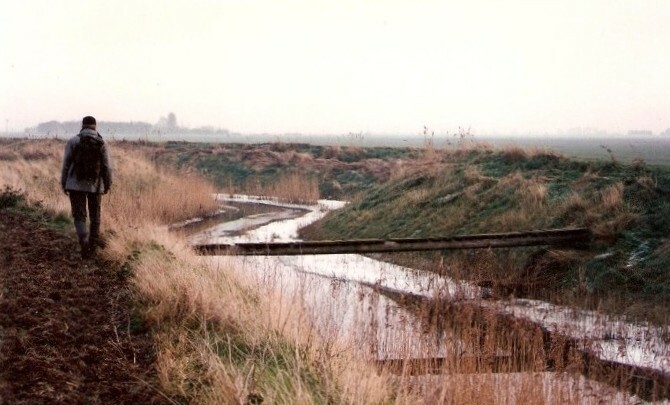 This information section has been compiled as a response to a large number of group leaders who have expressed interest in walking out on 'The Dengie', our remote 60 sq miles, of freshwater marsh, isolated farmland, and seawalled coast. ABOVE: Mid-winter at dawn out south of Sandbeach with temperatures around -7 deg C and a total frost. 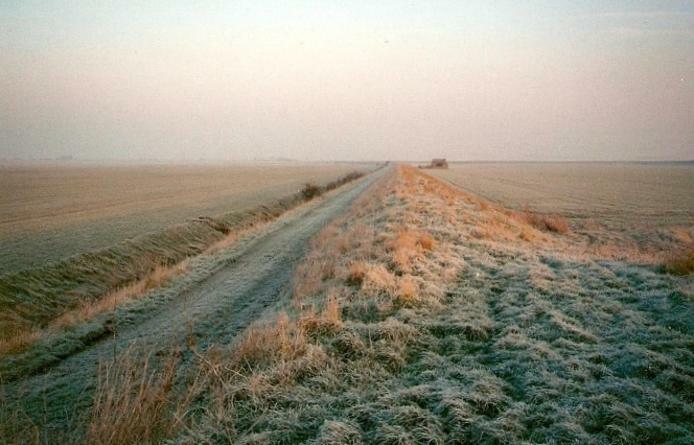 Dengie is mysterious, beautiful in all its various seasons, with big skies, and very few buildings. Its flood defences include wide rivers, high sea walls, deep water filled ditches, and the odd redbrick pumping station. The residents are wary of strangers, and invariably react should you be found on their private land without permission. Most farms are a few metres above sea level. Most land is at or below sea level. Cover and protection from wind, and horizontal rain is, in many places, non-existent. Above: An archive picture of Barry Howard about to cross the old bridge over Asheldham Brook at 'Zero-Zero' - named after the grid reference nearby of 000000. Apparently one had to be quite courageous to get across this. Can't think why. ABOVE: overnight early Autumn camp on our meadow, looking south into the valley of the Asheldham Brook. Tent is a Terra Nova Solar 2 for you afficionados. Despite (or because of) the flatness, the north or east wind will cut across the area producing a windchill that is, outside of summer, below freezing one day in every three; in winter that rises to two days in every three, and in winter at night usually three days out of every three. When winter walking, backpacking, guiding, working, and instructing, we wear full winter mountaineering multi-layered clothing with multi-functional survival gear in our rucsacs. Please be aware of this. Walks and treks in high summer are, here, in desert conditions; there are no places to re-fill water bottles, and very few trees grow on The Dengie; distances are difficult to judge due to heat haze, and few cars travel what few roads there are. Walking in these conditions demands carrying a day's water each, wearing lightweight clothing which protects the whole of the body from the sun, and a full-brimmed hat. We have had more cases of heatstroke out here than on summer mountain expeditions. 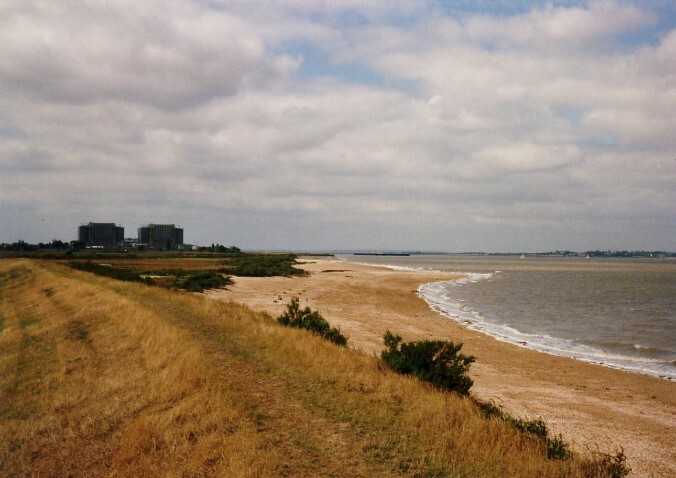 South of Bridgewick one can be two hours from the nearest building, mobile phone reception is not guaranteed, ambulances do not cover the area, the Essex Air Ambulance does not have a night-flying capability, and public road access to anywhere on the sea wall is totally non-existent. Thus day-walks do not take place in this south east corner; should group leaders wish to 'explore' this area then they would be very wise to be accompanied by one of our guides who will have risk-assessed the day's activities and will have put into motion an emergency fall-back plan. Clothing in any other season than high summer needs to include strong footwear, full waterproof outer jacket and overtrousers, base and mid layer - and fleece-type jacket which are insulative, and hat, gloves, and scarf. For night activities: walks and emergency training - torches are essential; take a small rucsac with spare food and clothing; Hunter Instructors may well give clients extra safety and survival equipment to carry in their sacs. Notwithstanding this, the area is very good for challenging young people in outdoor work; remoteness from central heating, streetlights (there are none), no towns, few villages, few shops, and long distances, and the need to be personally organised can all be a powerful tool to start to change perceptions on urban living. Mountain Leader, Senior Survival Instructor, HUNTER Outdoor Training. 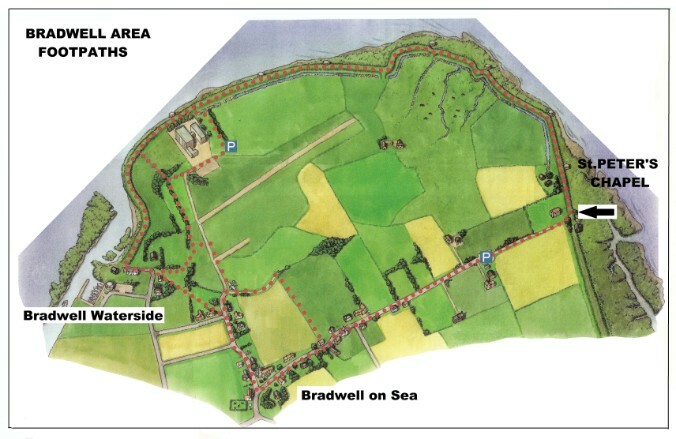 The Bradwell area, about 10 - 15 mins drive north of the Centre is a good place to start exploring the Dengie; the only public car park is at the end of the road 400m west of St.Peter's Chapel. The car park ** in the north of the area near the power station is on 'Magnox' power station property but the public have had de facto / permissable access for over 30 years as long as walkers keep to the east of the meadow on the east side of the power station land, access to which is at the north eastern corner of the gravel car park. 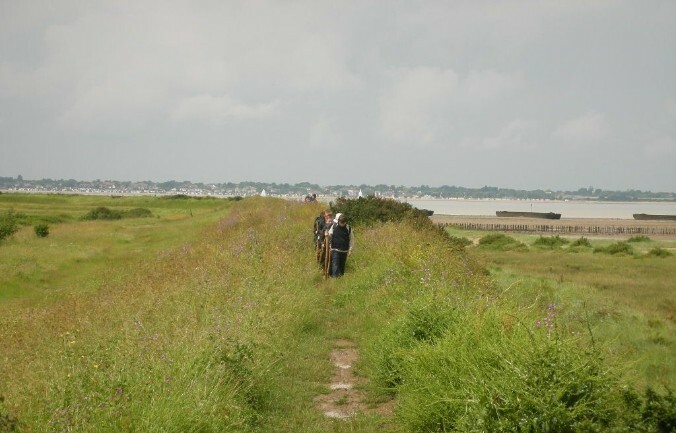 The distance of the circular walk from Bradwell-on-Sea to St. Peter' Chapel and return via the power station is around 4 1/2 - 6 miles depending upon exactly which of the smaller link routes you use. We can advise you on the most suitable route. This is the least remote area on the Dengie peninsula. ** NOTE: The route north from the car park near the power station to the sea wall is now closed.